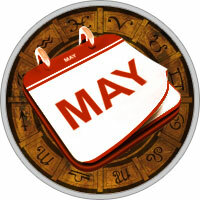 On March 20 the planets began to shift from the upper to the lower half of your Horoscope. Last month the shift got even stronger. This month 60 per cent and sometimes 70 per cent of the planets are below the horizon of your chart. Your career goals have more or less been attained and now it is time to focus more on the home and family and to get this area of life in order. Career is still very important but you can shift some attention to the home and to your emotional life. There is a need now to find (and function from) your personal point of emotional harmony. When this is found, the career will go well in very natural ways. If you've been ignoring the family recently now is the time to start mend­ing fences and restoring harmony. You are still very much into a yearly financial peak until May 20. Prosperity is happening but there are some bumps along the way. A Solar Eclipse on the 10th occurs in your money house, and this indicates dramatic financial changes. These changes probably needed to be made long ago but now the eclipse forces the issue. The changes seem good in the long term, but in the short term they are not comfortable. Health and energy are still very good, but it won't hurt to reduce your schedule during the eclipse period. This Solar Eclipse also affects children or children figures in your life. Often it brings life-changing kinds of events in their lives. They are forced now to redefine their image, their personal­ity and the way they think of themselves. Generally this leads to wardrobe changes - changes in hair style, hair colour and overall presentation. There is a Lunar Eclipse on the 25th in your 9th house. Though the eclipse is basically benign to you, it won't hurt to take things easier. Like every Lunar Eclipse the home and family are affected (so it is good that you are focusing more here). Family members can be more temperamental, so more patience is needed. Often there is a need for repairs in the home as hidden flaws come out. Students seem affected strongly by this. There can be changes of school or changes in courses or educational plans. There will be dramatic, life-changing kinds of events with the people at your place of worship or with a religious organi­zation you belong to. On the whole though, the month ahead looks good. Venus will be travelling with Jupiter towards the end of the month (from the 27th to the 29th); this indicates a nice payday, a nice financial windfall or opportunity. For singles this shows a happy love meeting. For those who are married it indicates more romance with the present partner.